Located near Piazza Navona, the 15th-century Basilica di Sant’Agostino is home to the Cavalletti Chapel, where visitors flock to view Caravaggio’s Baroque masterpiece, La Madonna di Loreto, along with The Prophet Isaiah by Raphael, La Madonna del Parto statue by Sansovino, and the sumptuous high altar by Bernini. Although the church is dedicated to Saint Augustine, it’s actually the saint’s mother—Saint Monica—who is entombed there, but the Basilica of St. Augustine's main attraction is by far the rich art inside. 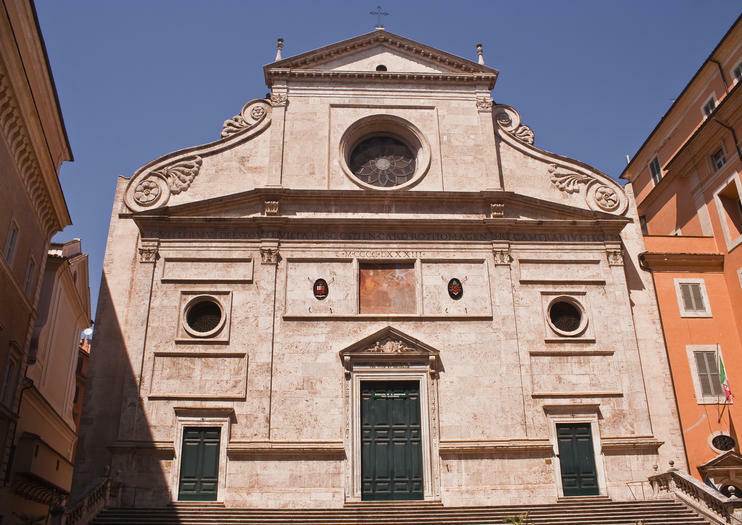 You can visit the church by joining a walking tour of Rome's Baroque masterpieces that includes the art in this basilica as well as in other Roman churches by Caravaggio, Raphael, Michelangelo, and Bernini. When visiting Catholic churches in Rome, you must wear clothing that covers your shoulders and knees. Walking tours require some time on your feet, so choose comfortable shoes. The church isn’t wheelchair- or stroller-accessible; there are stairs at the entrance. Flash photography is not allowed inside the church. The Basilica di Sant'Agostino (also known as Sant'Agostino in Campo Marzio) is located on Piazza di Sant'Agostino in the heart of Rome's historic center, just off Piazza Navona. Rome's most famous churches can be crowded in summer, so visit first thing in the morning or late in the afternoon to be able to enjoy the art in relative peace. The church is usually closed in August. It is said that Jacopo Sansovino's La Madonna del Parto was originally a Roman statue of the Empress Agrippina holding her infant son Nero, which Sansovino reworked into a Christian rendering of the Madonna and child centuries later. The statue is said to have miraculous fertility powers, so it is usually surrounded by offerings from women who believe it interceded on their behalf. Learn about Italian art and sculpture in Rome with a private guide during this walking tour. Choose a start time that is convenient for you and set out to see the work of great Italian masters like Caravaggio and Michelangelo. The itinerary includes St. Ignatius Church and the Church of Sant’Agostino and can be customized according to your interests. Take a tour of baroque Rome with your own private guide, and enjoy a flexible itinerary for your sole group of up to eight people. On the trail of esteemed Italian artists such as Bernini and Caravaggio, you’ll explore the churches of the capital to discover artwork and architectural features that hail from the baroque period. Two start times are available when you book. Trace the dramatic life and visual legacy of Caravaggio on a private art tour in Rome. Visit beautiful churches to admire the painter’s original works while an expert guide shares scandalous details of his life and how he shaped the Baroque movement. Geared towards art enthusiasts, it's a great way to delve deeper into one of Rome's most influential and enigmatic masters. Emotions, more than words, will help to read and understand the mastery and greatness of an artist who, with his painting, has been able to reach beyond the border of darkness, leading the viewer into the glory of light!The basilicas of Sant'Agostino, San Luigi dei Francesi and Santa Maria del Popolo are the precious treasure chests, which preserve unique and marvelous masterpieces: the large canvases created by MICHELANGELO MERISI, called IL CARAVAGGIO!The proposed visit is a journey to discover the works of Caravaggio preserved in Rome and exhibited to the public. There was more than one Michelangelo? Absolutely. Michelangelo Merisi, the ‘black’ painter, better known as Caravaggio. During this walking tour, we´ll learn about his / her very interesting life.The churches of St. Mary of the People, St. Augustine and St. Louis of the French all hold works from Caravaggio dating from the end of the 16th century. This was a time when the Catholic Church was commissioning "uplifting art - highly ideological images of angels, heaven, lands and abundance, but this was not Caravaggio's style. Caravaggio painted ‘real life’ images; human beings plagued by fatigue, old age, sickness and misery. He painted torture and death. You can guess, this didn't make him very popular with the church. We'll tell you about his life and why he painted this way. His story is, in our opinion, probably one of the most fascinating stories in the history of art.